Why would anyone spend six months carefully gathering painted plywood boards that have been stored in basements, garages or even in back alleys? 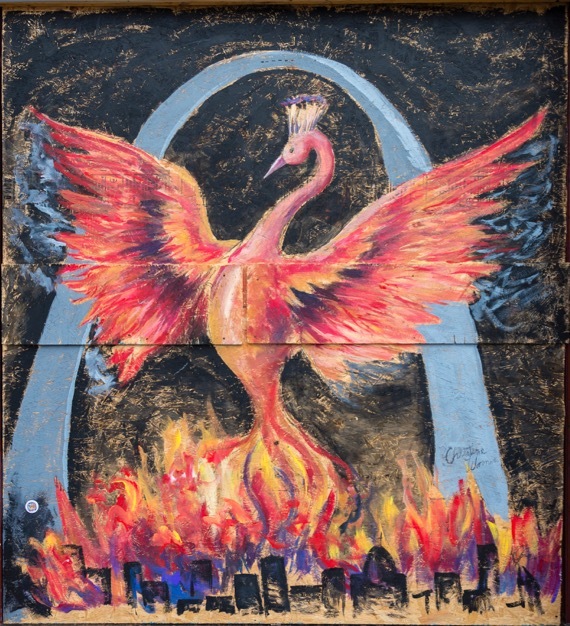 Because those boards are now part of a significant, first-of-its-kind art exhibit in St. Louis launched in September and hosted by five different galleries at major cultural institutions throughout the city. Called "outside in/Paint for Peace" this exhibit has a remarkable back-story. More than three hundred colorful, moving paintings were created in less than a week, transforming block after block of plywood covered windows. The grassroots effort was organized by local residents Tom Halaska, Mike Lonero, Dana Sebastian Duncan and several others across the city. 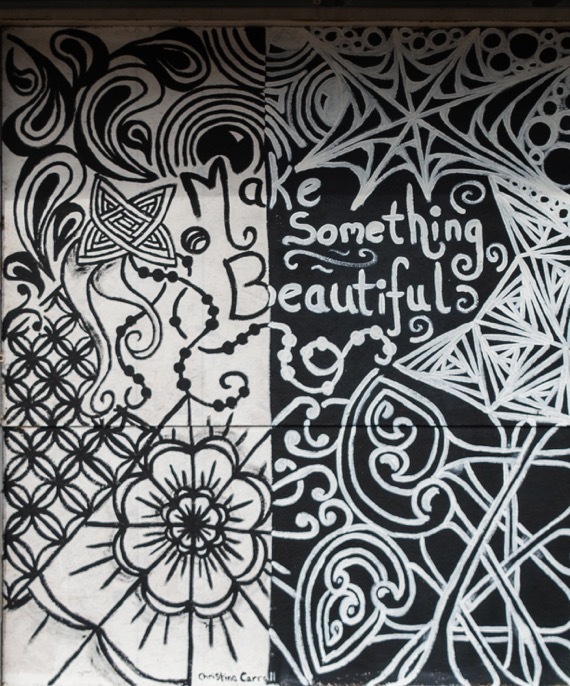 It exploded on social media so that within days an estimated 400 artists and volunteers armed with thousands of paintbrushes and using donated paint, descended on the boarded up areas creating art from the heart. There were no design parameters or selection committees. "I understood that what we were doing would keep on giving," said artist AJ Rosenberg whose art is featured in the exhibit. "Everybody was finding a way to be part of it -- creating the peace. It wasn't a consideration of, 'Am I going to be welcome? It was just, 'Go and do it.'" 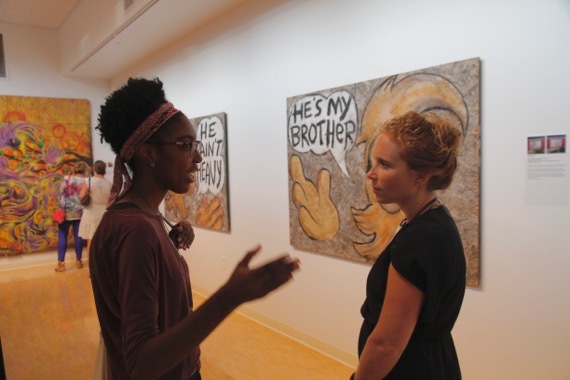 Across the U.S., other communities have witnessed unrest and the calls for change ... but few had this community outpouring through art in response, as a way to begin the healing. This art transformed the boards on which it was painted -- but also those who created the murals -- as well as those who witnessed the "Paint for Peace" effort. I was one of those. In many ways this remarkable event changed my life. I wanted to capture both this amazing story and the artwork and the result was the award-winning children's storybook "Painting for Peace in Ferguson." The ripple effects continue. By building on the awareness generated by the book and by teaming with the community arts organization COCA, the city wide "outside in/Paint for Peace" exhibit curated by Jackie Lewis-Harris was created, which is now on display at major cultural institutions including COCA, the Missouri History Museum, The Sheldon Performing Arts Center, and the University of Missouri St. Louis into November. The paintings, created on a monumental scale of 4' x 8' sheets of plywood and particle board, have moved from the streets where they were created to now shine in the light in a gallery setting. Now more of the community can continue to reflect on the emotions and questions that were present during the turmoil when they were created and that are still with us today. The response to the exhibit has been very enthusiastic both among adults and families and school groups. It truly continues the dialogue that we need to have in this nation and the hope is that there would be interest in bringing the exhibit to other cities across the country. By coming together and helping one another, by setting aside fears or what divides us, remarkable things can happen. Another participating artist Christina Carroll said "It was incredible to watch as my community was transformed from a place of pain and sorrow, to the most beautiful gallery of art." Through music and images this video montage below tells the transformational story of "Paint for Peace". More paintings can be seen in the nationally award winning book "Painting for Peace in Ferguson" a 2016 ILA Teacher's Choices booklist selection. Or you can create your own artistic interpretations by coloring in "Painting for Peace - A Coloring Book for All Ages". 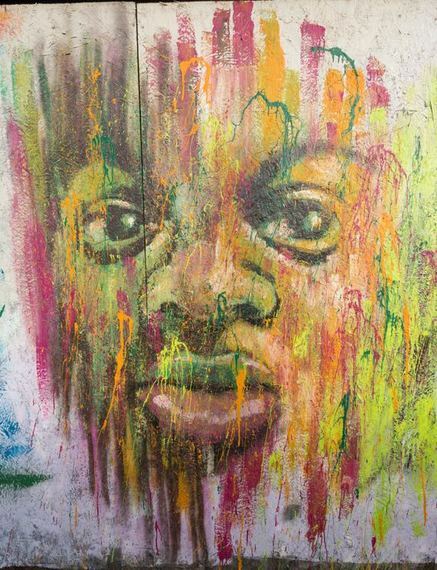 The "outside in/paint for peace" murals will be on exhibit in multiple locations this fall.